The average exchange rate of Japanese yen against the U.S. dollar during the first nine months appreciated by ¥0.87 year on year to ¥110.49. The average bunker price during the same period rose by US$123/MT year on year to US$464/MT. As a result of the above, we recorded revenue of ¥942.2 billion, operating profit of ¥29.6 billion, ordinary profit of ¥24.6 billion and profit attributable to owners of parent of ¥20.0 billion. The following is a summary of business conditions including revenue and ordinary profit/loss per business segment. In the Capesize bulker market during the first half of the fiscal year, the market rate rose for a time amid a recovery in iron ore shipments from Western Australia and Brazil but then weakened through to the end of the second quarter, reflecting the impact of trade friction between the U.S. and China on market sentiment. At the beginning of the second half, in October, the market rate remained in the range of US$17,000 to US$18,000 per day, supported by firm spot demand. However, in November, concern over deterioration in vessel supply-demand dynamics triggered by a freight train derailment in Australia led to panic selling in some parts of the market and caused the rate to fall sharply, reaching the range of US$8,000 per day. From the late November, the market recovered thanks to the returned spot demand, and in December the market rate remained roughly in the range of US$16,000 per day although it dropped before the Christmas holidays as a seasonal factor. The Panamax market held firm in the first half of the fiscal year, supported by steady volumes of mainstay cargoes such as coal and grain shipments from South America. This trend continued into the first half of October, with the rate remaining in the range of US$14,000 per day due to steady volumes of coal shipments from Australia and Indonesia and grain shipments from the east coast of South America. However, lackluster grain shipments from North America amid trade friction between the U.S. and China and China’s temporary restriction of coals imports caused the rate to weaken and hover in the range of US$11,000 to US$12,000 per day from November. 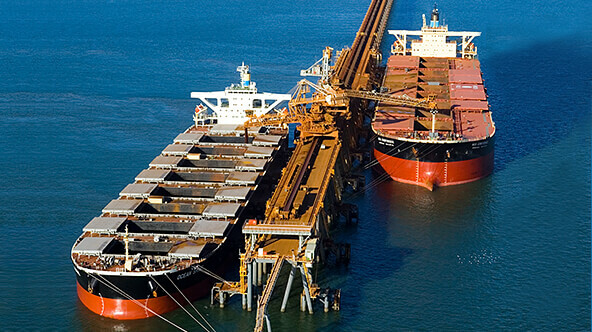 Facing such market conditions, the dry bulk business posted a year-on-year increase in ordinary profit. The very large crude oil carrier (VLCC) market picked up from the first half of the fiscal year when the market was weak due to declining transportation demand as a result of seasonal factors. During the third quarter, the market remained strong overall due to factors such as the arrival of the winter demand period and increased crude oil exports from West Africa and North America as alternative sources to crude oil from Iran. The product tanker market picked up from the first half of the fiscal year when the market was weak overall due largely to excessive vessel supply, and from the second half of November, the market was back on a recovery path thanks to the arrival of the winter oil demand period and tighter vessel supply-demand dynamics reflecting the allocation of some large product tankers to the transportation of other commodities such as crude oil and heavy oil. Facing these conditions, the tanker division posted a year-on-year decline in ordinary profit despite ceaseless efforts to improve operating efficiency through pool operations and cut costs alongside stable fulfillment of long-term contracts and steady implementation of contract extensions. The LNG carrier division recorded a stable ordinary profit mainly through medium- to long-term charter contracts, including four newly built vessels. The offshore business division also recorded a stable ordinary profit, brought about by steady operations of existing projects including FPSO and subsea support vessel businesses. At Ocean Network Express Pte. Ltd. (ONE), the Company’s equity-method affiliate, utilization rates, which were weak in the first half, improved considerably overall, despite being slightly below expectations for some routes such as Asia-Europe routes. Although ONE posted a loss in the third quarter, the improved utilization rates combined with steady Asia-North America freight rates and measures to cut operating costs helped to decrease the loss compared to the previous internal forecast. Trade friction between the U.S. and China led to reduced shipments of completed cars to China whilst compliance with new exhaust emissions and fuel economy standards resulted in decreased shipments of completed cars from Europe. The Company endeavored to further improve operating efficiency, but the additional costs caused by quarantine problems on some routes in the first quarter had a major impact and the ordinary profit of the car carriers division worsened year on year. In the business of ferries and coastal RoRo ships, cargo volumes maintained the firm tone seen the previous fiscal year amid a modal shift caused by truck driver shortages and aging and tighter labor controls in Japan. In addition, aggressive promotion of the concept of casual cruises attracted more passengers. As a result, revenue was up year on year. However, ordinary profit decreased year on year mainly due to higher fuel costs. In the real estate business, ordinary profit decreased slightly year on year, mainly due to the effects from changes in major tenants, despite a firm office leasing market centered on the Tokyo metropolitan area. The cruise ship business and other associated businesses, such as the tugboat and trading businesses, showed firm performance overall. However, ordinary profit of the associated businesses segment as a whole decreased year on year. Other businesses, which are mainly cost centers, include ship operations, ship management, ship chartering, and financing. Ordinary profit in this segment decreased year on year. Looking ahead at the dry bulker market in the fourth quarter and beyond, we expect that the market will weaken due to uncertainty over the trade friction between the U.S. and China and seasonal factors such as a slowdown in iron ore shipments with the start of the rainy season in Brazil and Australia and decreased demand during Chinese New Year. However, there is not much time left before the end of the fiscal year and the impact on full-year ordinary profit is expected to be limited. After peaking at the end of 2018, the very large crude oil carrier (VLCC) market has gradually weakened since the beginning of 2019 and we anticipate repeated ups and downs until the end of February, which is the winter demand period. We expect that the product tanker market will continue to hold firm, reflecting the winter demand period. In the containership business, ONE faces an uncertain external environment, with the ongoing trade friction between the U.S. and China, the economic trends in Europe, and the impact of Chinese environmental regulations on backhaul cargo volumes. However, ONE will continue working to improve its financial results through measures such as cutting operating costs. In consideration of these prospects, for the full year, we project revenue of ¥1,210.0 billion, operating profit of ¥35.0 billion, ordinary profit of ¥28.0 billion and profit attributable to owners of parent of ¥21.0 billion. Total assets as of December 31, 2018 decreased by ¥ 53.3 billion compared to the balance as of the end of the previous fiscal year, to ¥ 2,171.7 billion. This was primarily due to the decrease in Vessels. Total liabilities as of December 31, 2018 decreased by ¥ 87.0 billion compared to the balance as of the end of the previous fiscal year, to ¥ 1,510.0 billion. This was primarily due to the decrease in Long-term bank loans. Total net assets as of December 31, 2018 increased by ¥ 33.6 billion compared to the balance as of the end of the previous fiscal year, to ¥ 661.6 billion. This was primarily due to the increase in Retained earnings. As a result, shareholders’ equity ratio increased by 1.7% compared to the ratio as of the end of the previous Fiscal year, to 24.7%.